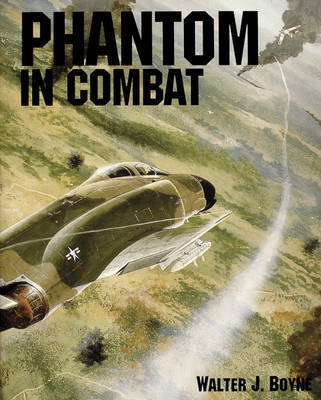 Phantom in Combat puts you in the cockpit with the missile-age aces as they fight for their lives in the skies of Vietnam and the Middle East.\nStarting with a brief account of the forging of this deadly weapon, Phantom in Combat moves to the wars, campaigns and single engagements in which it was used to such telling effect. Leading USAF ace Steve Ritchie speaks more in sorrow than anger of the politically inspired rules that so frustrated him and his comrades in Vietnam. The story of the gruelling dogfight that made Randy Cunningham and Willie Driscoll the U.S. Navys only aces is redolent of the sweat, toil and terror of high-speed air fighting. And combat reports from some of Israels anonymous aces speak laconically of victories, losses, hairs-breadth escapes, and, above all, the Phantoms ability to give and take enormous punishment.\nProviding a rich background to this testimony is a wealth of rare material, including:\n- Battle-damage and gun-camera photographs\n- Recently declassified U.S. Navy tactical diagrams\n- Photo-sequence showing the destruction of an F-4 by a North Vietnamese missile.\n- Official analysis of the USAFs most successful MiG-trapping operation, led by the famous General Robin Olds.\n- Complete listing of USAF and USN air-to-air victories in Vietnam.\nHere is the human face of modern air warfare, described by the commanders and crews who earned for the Phantom its reputation as the worlds finest fighting aircraft.